Mobile Suit Gundam 00 is the 11th incarnation of the Gundam franchise, and it is the third series that I've taken on in this marathon. It is an extremely striking example of the effect of the Post-9/11 cultural upheaval. What does that mean exactly? I'll certainly cover it. This Gundam series was mentioned by Stormborn in my Gundam SEED review. 9/11, of course, refers to September 11th, 2001, when a terrorist attack occurred within New York City, USA. The attack used jet airliners to collide with the World Trade Center skyscrapers within the city. The buildings would go on to collapse and many lives were lost immediately with countless more lost in the chain of events that followed. This event caused a massive impact to the world's psyche. The immediate aftermath brought emotions like anger to the forefront of many. The long chain of war and terrorism that followed caused more complex emotions to develop within many across the world. Gundam 00 was released in October of 2007, six years after 9/11, when the polarizing "war on terrorism" was in full effect. As such, the series has some rather interesting things to say on the matter, which will all be covered in the review. Gundam 00 follows the exploits of a secret paramilitary organization called "Celestial Being", which was founded to eradicate war by any means necessary. Celestial Being makes use of the Gundams as a means to this end. First thing's first, Gundam 00's cast is a really complex bunch. Celestial Being is made up of a big group of people that have all joined to end war at any cost. Why exactly they did so is always complex and it doesn't always follow a common element. Maybe they joined because in a world without war, there would be no need to test military technology on humans. Maybe they joined because they were unwittingly forced into doing terrible things by manipulative warmongers. Maybe they caused the death of so many that they declared to themselves that they would end it once and for all. I TAKE IT BACK. That isn't fair! Oh dear god, stop doing this writers. I take it all back! Just let them keep doing what they were doing! I DON'T WANT THESE THEMES TO BE APPLIED TO THEM. GET AWAY. As a Gundam show, it inevitably going to be an explosive and action-ridden series. It doesn't skimp here, Gundam 00's action is always high-octane and tense. A striking part of Gundam 00 is how it has a very clear plot with very clear goals from the first episode. Many Gundam shows tend to drag their feet when it comes to defining what exactly the end goals of the characters is, but Gundam 00 has a very strong plot in the first season. Every plot twist ramps up the tension and puts the pressure on the four Gundam pilots that are taking on the world. The biggest thing that Gundam 00 does right is three of its themes: terrorism, the justification of meeting violence with violence, and God. Celestial Being is, from the very start, labelled a terrorist organization by nearly every world government, despite the fact that their mission statement is to destroy war. As the show goes on, there is plenty of commentary on terrorism and how it can easily promote war in the wrong ways. It questions what exactly terrorism is and why it is both justified and condemned. This goes hand-in-hand with the next theme: the justification of meeting violence with violence. Naturally, 9/11 resulted in the war on terrorism. This is the clearest commentary on 9/11 that I can see in Gundam 00. The show takes this one on in spades. The show opts to question how exactly meeting violence with violence is going to solve anything. Many characters wonder aloud what exactly Celestial Being is going to accomplish by meeting force with force, which will only result in more force. The show doesn't take a definite stance on it either, at least not entirely. The show realizes that there is no easy answer to this question. And that leads us to one of the most interesting themes: God. Let's start by saying that the protagonist hates the idea of God. He hates it. He actively goes around saying "there is no God in this world". The reason? People use God as a justification for war too often. He himself has been a victim of it. In a way, he suggests that a God would never allow a world such as the one they live in to exist; one where God is used as a way to justify killing. The series goes on to explore how terrorism, violence, and this God theme all relate to each other and why that is a dangerous combination in any reality. The entire first season becomes an unstoppable train of narrative momentum largely due to the clear plot, exploitation of these three themes, and the gigantic commentary on the real world sociopolitical system. The second season, while not as unstoppable, is respectable in its own right, weaving together themes about the nature of God and how humanity needs to change. Naturally, there are many more themes that exist in the series, but these are the three that set it apart from other Gundam shows. I think the symbol we're looking for might be behind the wings. When it comes right on down to it, symbolism is everywhere in Gundam 00. Many of the symbols are closely related to the themes of the series and serve to further illustrate them and give them meaning. Sometimes it can be implicit and difficult to grasp, but the meaning is there. The last big thing that Gundam 00 did right was the tear jerk moments. Seriously, this series can really rip your heart out. There are many moments in the series where I wouldn't blame people for shedding a few tears. SO MANY FEELS. The first season's narrative momentum is tempered by the second season, which fumbles a bit with some of its commentary. The first season has a ton of deep commentary going on when it comes to terrorism and violence. The second season leaves some of this behind in favor of a stronger emphasis on the God theme. It doesn't quite result in the same momentum as the first season. As a result, it definitely feels like the second season's whole arc is underwhelming. The God theme is played pretty big though, which can be pretty good (see The Great section). It doesn't have nearly the same resonating themes and plot that the first season did. It falls into a pretty standard Gundam plot in that it defines an enemy, in opposition to reluctance that the show had to do so in the first season. After that, things are pretty predictable for a Gundam show. To be perfectly honest, I thought that the character designs and the Gundam designs were a bit lacking in this incarnation though. Compared Gundam SEED's very memorable Freedom Gundam, the Exia and 00 Raiser aren't that memorable. Nothing about the 00 Gundams really jumped out at me and stuck in my mind. Gundam 00 is an interesting Gundam series that has been clearly influenced by the Post-9/11 modern world. Its biggest strengths lie in the deep commentary on the modern sociopolitical world and on how it examines themes like God and violence. Complex topics like child soldiers, terrorism, and violence take the center stage in the plot and drive the themes even further. The themes and plot are powerfully presented and ripe with symbols. Altogether, it is easy to see why this can be so easily be classified as a "Post-9/11" TV series. It is clearly a reaction to many of the changes and events that have taken place since the infamous day in question. This is best for those that want an examination on these sorts of themes and like some good action along with it. The first season is an absolutely unstoppable narrative force and the second season is okay too (although not as good). The characters, plot, and themes are all complex and very well presented. I thought it was a very pleasant anime all things considered, there's a lot of subtext to read into and a great deal to analyze long after you've stopped watching. It's worth a watch. 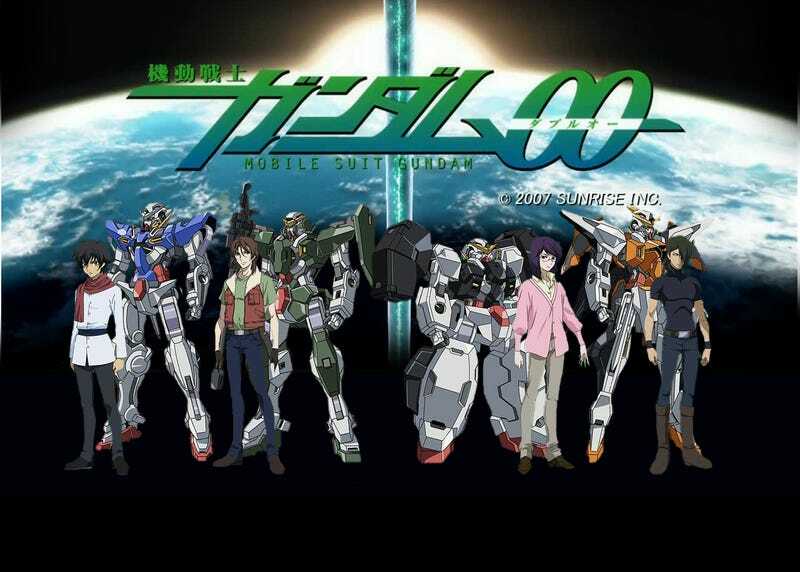 Gundam 00 is available for streaming Youtube. Code Geass is complete, so a review should be incoming. Something else Gundam related will be happening too. Valvrave the Liberator ends later today, so you can expect that review very soon indeed. White Album 2 ends later this week too. My last review item is in progress and is due to be ready on the 31st. Basically, you can expect a lot this week. Okay? This is part of my Anime Review Marathon that I began in October 2013 to record my thoughts as I watch a variety of anime on my ever growing backlog. These reviews won't come out on a consistent basis, they'll come out when I feel I have seen enough of a series to pass a judgement on it, although I will usually finish the whole series before the review.